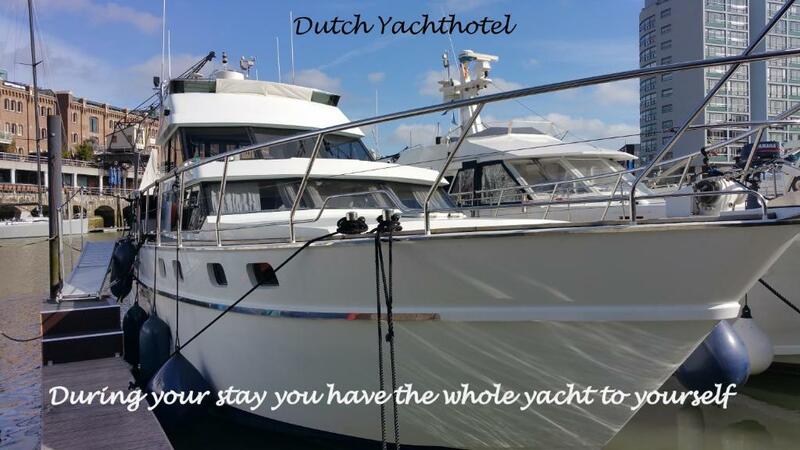 Lock in a great price for Dutch Yachthotel – rated 8.9 by recent guests! What a superb place to stay, Captain Willem couldn’t have made us feel any more welcome on his yacht. Arranged to check in at 2pm and was given a guided tour of the yacht and some pointers on where to eat, drink locally etc. Everything is absolutely top notch, and being served breakfast on board is a real treat. As an added bonus we also enjoyed a boat trip with Willem to discover the glories of Rotterdam. Willem is a genuinely fascinating and passionate guy who can’t do enough to make sure you enjoy your stay. Nice location, pleasant stay . We got a surprise upgrade to Christina Onasis. We liked the hospitality of Capt. Williem & steward. Overall we had a wonderful experience. It was quite a new thing for us to spend a night on a yacht and may I say- really enjoyable! The captain, who let us in was really nice and we had a great chat with him- he is very passionate about his job and really cared for our comfort on the boat. The yacht itself was very well-equiped and our stay was most comfortable! The breakfast was served really nicely and professionally and we really enjoyed it! It was very nice experience to spend 1 night on a yacht. The interior of the yacht was wide and well equipped. unser Aufenthalt auf dem Yachthotel war großartig! Eine toll eingerichtete Yacht, einem sehr umfangreichen und persönlich zubereiteten Frühstück durch den Kapitän. Dazu noch schöne Hafenrundfahrt. Vor allem durch den Kapitän, der von ganzen Herzen und engagiert ist, war es eine wunderschöne Zeit! Dank aan de kapitein, ons verblijf was geweldig!! De charme van onze kapitein Willem. Lekker ontbijt. Super ligging, heerlijk rustig niets gehoord. 's Morgens zaten we zalig rustig op het dek en hoorde we enkel de vogeltjes. Op 20 min wandel je naar het centrum maar Willem bracht ons met zijn sloep. Top Lage. Wer mal was anderes als ein klassisches Hotel möchte ist hier richtig. Sehr schöne Umgebung. Frühstück war sehr gut (Preis/Leistung). Hafenstadt pur. Parken in direkter Umgebung oder Parkhaus problemlos möglich. Dutch Yachthotel This rating is a reflection of how the property compares to the industry standard when it comes to price, facilities and services available. It's based on a self-evaluation by the property. Use this rating to help choose your stay! 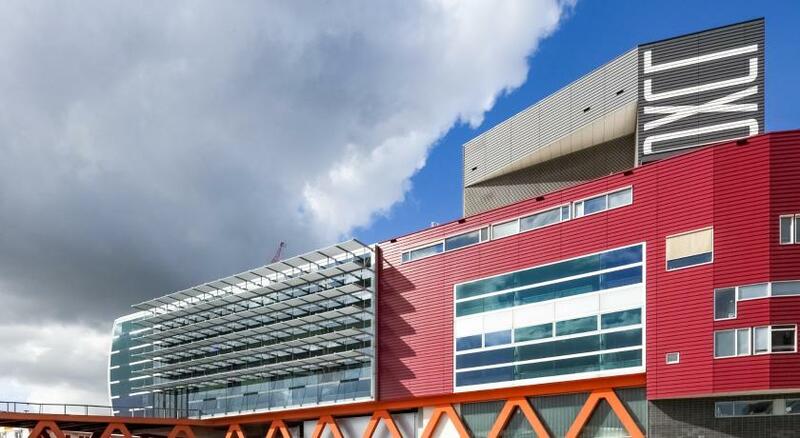 Housed on a 50 feet long yacht, Dutch Yachthotel is located in Rotterdam. Free WiFi access with a complimentary laptop is available on this boat. The yacht offers guests private use during their stay. The yacht will provide you a seating area, a flat-screen TV with satellite channels and a DVD player, coffee/tea making facilities and a terrace. There is a well-equipped kitchenette with a microwave and a refrigerator. Both suites on the yacht have a double bed and have their own bathrooms with a shower and a toilet. You can enjoy river view from the room. The child rooms have 2 bunk beds. Both yachts are located next to eachother and can be rented together (8 persons and 2 children). At Dutch Yachthotel you will find free bikes. Other facilities offered at the property include grocery deliveries, water sports facilities and a games room. An extensive breakfast will be served on deck. If you feel like visiting the surroundings, check out Ahoy Rotterdam (2.2 miles) and Diergaarde Blijdorp (3.5 miles). Rotterdam Central Station is 2.2 miles away, while Schiphol Airport is 38 miles from this boat. The property offers free parking. 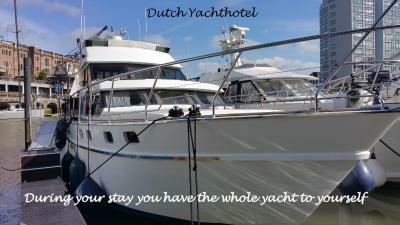 When would you like to stay at Dutch Yachthotel? Area Info – This neighborhood is a great choice for travelers interested in skyline views, harbors and restaurants – Check location Excellent location – show map Guests loved walking around the neighborhood! House Rules Dutch Yachthotel takes special requests – add in the next step! Please note breakfast can be served by a captain in uniform. After breakfast a city sail trip can be booked. Please inform Dutch Yachthotel of your expected arrival time in advance. You can use the Special Requests box when booking, or contact the property directly using the contact details in your confirmation. I like yachut and captain wiliam..so cooperative. some seasickness when the other ship passed.